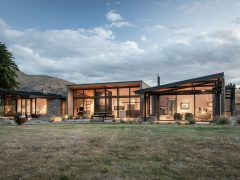 Located on the shores of Lake Hawea, this family home seeks to capitalise on the exceptional views available down the lake, whilst working within restrictive planning constraints limiting the width of the building and also its height to 4.5 metres. Lake Hawea is known for its seasonal onshore winds and protected outdoor spaces sheltered from this wind were an essential component of the brief. The design solution was to nestle the building into the site using the bulk of the home to provide protection from onshore winds. The house is arranged in a “H” shaped configuration creating a series of terraces and courtyards that can be occupied at different times of the day depending on sun and wind patterns. The rear courtyard provides a sheltered retreat on windy days whilst maintaining a visual connection to the lake and the mountain views. The plan form of the house is logically arranged positioning living spaces and master bedroom to capitalise on views and solar gain. Garaging and ancillary spaces are positioned to the rear of the property. Clad in cedar, schist and metal, this understated palette continues internally with cedar ceilings, white walls and polished concrete floors. Two heavy stonewalls constructed of locally sourced schist flank the living spaces. These walls are orientated to the view and form a pair of organising axis that run through the house. An early concept was to create a series of heavy remnant walls that anchor the building to the site. These walls contain seating, shelves, fires & other service elements. These thick stone walls evoke a sense of an older structure that has been incorporated into the fabric of the new building. The roof forms with their cedar-clad ceilings contrast this. They span lightly over the spaces changing direction to direct the observers view.